"I was probably a little too aggressive. It kind of blew up in my face the last couple of miles … I wouldn't do it any other way." Hanson's runner Mike Morgan (2:15:27) after leading Sunday's California International Marathon for 23 miles before Josh Cox (2:13:51) and Tesfaye Girma-Bekele (2:13:42) passed him. In the link is a good recap of the race from The Sacramento Bee's John Schumacher. Q for Renato Canova, Aerobic House - Gradual or Quick Mileage increase? Fukuoka Marathon - Tsegaye Kebede Negative Splits; Smashes Japanese Soil Record 2:05:18 - Will HE Be The Next WR Holder? Tiny Tsegaye Kebede showed he knows the best way to run marathon records, hammering home a 29:14 from 30-40k to lock up a 2nd-straight Fukuoka win and course record 2:05:18. Kebede's only 22 and his marathon PR is only 8 seconds away from Sammy Wanjiru's. Tekeste Kebede finished 2nd in 2:07:52, while Ukranian Dmytro Baranovskyy became the first European under 2:09 in 2009 to get third. "Previously, I was training in a group with a coach but I am nowself-coached," Tekeste Kebede, 28, said. "I think it gave me an opportunity to think about the right training for me and that I think is the reason why I was able to improve the personal best by a huge margin." - 2nd-place Tekeste Kebede after an Ethiopian romp in Fukuoka. Nike Commercial Between Races Features Alan Webb In A Galen Rupp-Made Speed Cape Dathan Ritzenhein, Paula Radcliffe, Bernard Lagat, Abdi, Alan Webb were all at the race and on the broadcast. Michael Johnson - Let's See Jamaica Vs. USA Sprint Clash The idea of a duel meet where the top American and Jamaican sprinters match up has been thrown around for the past year or so. Doug Logan On US-Jamaica Duel - "We're Close." A little more money and a title sponsor. We're thinking a cruise line would be perfect. As usual, the hotly contested European XC Championships will be a mud fest. Reigning London and World Marathon Major champions Sammy Wanjiru and Irina Mikitenko will defend their titles in what looks to be again the world's toughest marathon fields. Two top challengers on the women's side are '09 Bank of America Chicago winner Liliya Shobukhova of Russia and '09 world champ Bai Xue of China along with a ton of either aging or rising stars. On the men's side, it's a stacked deck with world champ Abel Kirui (left), half Marathon sensation Zersenay Tadese, Kenyan record holder Duncan Kibet and once-unbeatable Martin Lel. Top Americans at this point are Deena Kastor, returning to the course where she set her 2:19 American record in 2006, and Abdi Abdirahman. Jenny Barringer Signs With Flynn Sports Management The bigger announcement in the release is the American and NCAA record holder's intention to stay in Boulder with Colorado coach Mark Wetmore as her coach. Colleen De Reuck Named USATF Masters Runner Of 2009 De Reuck had a time-warping year for a 45-year-old. She led most of the way in the Boston Marathon before finishing 8th, won a US title for the road 20k, and ran a 2:32 marathon at Twin Cities. Inaugural Eugene Women's Half Marathon Directed By Olympian Nicole Teter According to the press release and Teter, it appears the mission of this female-only race is to pamper the entrant as much as possible with "schwag" and perhaps free pedicures. Ladies, mark your calendars for Labor Day weekend 2010. Important Financial Force Jim Elias Steps Down From USATF Post Elias brought the books in order at USATF. LetsRun.com's The Week That Was Last week was a hodgepodge type of week in the running world but thankfully we have you covered. Our observations are short and all over the place, but nearly all running fans will have at least something that interests them. We talk about a wide range of characters including Sammy Wanjiru, Günther Weidlinger, Angela Bizzarri, Usain Bolt, Tyson Gay, Alberto Salazar, German Fernandez, Ryan Vail, Tim Montgomery, Caster Semenya, Aisling Cuffe, Lukas Verzbikas, Joe Rosa and others. Savas Sports Supplement Co. Terminates Wanjiru Sponsorship Deal Fortunately for Sammy, he made at least a million in appearance fees and winners' checks last year. 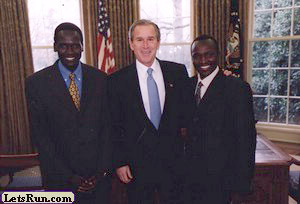 Article On Sammy Wanjiru And His Quest To Become Greatest Marathoner Ever Wanjiru, still 23 years old, in some experts' minds might already be the greatest marathoner in history. But as far as world stature, he is still way behind the great one, the Emperor Haile Gebrselassie. Former 200m and current 400m world record holder MJ is in Jamaica with BBC producers to make a Usain Bolt documentary. Easy for him to say - MJ pronounces Bolt could beat Americans LaShawn Merritt and Jeremy Wariner at 400m this year without much training. Crews, 25, has run 3 marathons and won all 3, including his latest, a negative-split PR 2:17 win in Philly to become the first American winner since Cornellian Brian Clas in 2000. LetsRun's Employee #1 finished 7 minutes behind Crews in 2nd. Former NCAA 1,500m champion, American record-holding DMR anchor and 4th-placer at NCAA cross-country Brie Felnagle fell off the radar last spring when she skipped the NCAA outdoor track season. She tells FloTrack she took time away due to burnout and is excited for her final outdoor season coming up. Josh Cox set a marathon PR at age 34, running 2:13:51 at the California International Marathon 9 years after running 2:13:55 in Chicago. *Daba won Tyson indoor 5k over Galen Rupp in 13:17 back in February. Singapore: Hot Weather Marathon Specialist Luke Kibet Runs 2:11 CR In 87 Degree Heat Kibet, the 2007 Osaka World Champion marathoner, is scary good in the heat and humidity. The Foot Locker 40-person finals are now set for next weekend. From the west, favorite Molly Grabill got the win in the girls' race and Flagstaff's Brian Shrader won the boys'. Patrick wrote to us Thursday with the disappointing news. For a sample of his writing, earlier this year Patrick broke the news (Steve Nearman broke the news) wrote a nice piece on American mile record holder Alan Webb leaving long-time coach Scott Raczko to join Alberto Salazar's group in Oregon. Everybody knows Bolt doesn't even consider it a party until he's watching the sun come up. The man runs 19.19, flies Ludacris to his party and can't have a proper bash? Conte, who says his goal is to be absolutely 100% clean, has clientele including Dwain Chambers and several boxers and fighters. Like all the Rock 'n' Roll events, you can watch the leaders on a live camera webcam. Hinz, who ran 2:12 in Boston in 1983, died in a car wreck this week. He was 56. A LRC reader from GBR wrote us an email about the selection process for Great Britain's Euro XC team. We share the email with you and use it as proof that the best way to select championship team members is by selecting based on their performance in a single qualifier rather than having subjective bids. 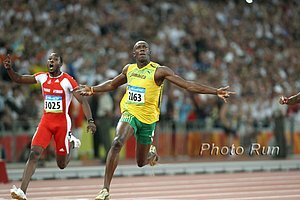 You Can Vote For The US Sports Academy's 2009 Athlete Of The Year 4 female tracksters and Usain Bolt made the final 12 voting. It's interesting to see who the finalists are, as Linet Masai, a chubby Argentinian golfer and Santonio Holmes are on the same ballot. Or you could vote for an inspiring athlete from another sport such as NASCAR driver Jimmie Johnson. State Of The Sport - Thumbs Up Or Down? Association Of Athletics Managers Meets To Discuss Diamond League Changes The new IAAF Diamond League series is going to be one of the biggest changes in 2010 for fans of and players in elite track and field. Singapore Marathon Runners Promised Cash On Time This Time That's always nice. IOC President Jacques Rogge Says Momentum Is With Drug Testers Catching Rashid Ramzi was a huge step in the right direction and a big boost for WADA and the IOC. Brief Chat With Villanova Women's Coach Gina Procaccio Former running standout Gina Procaccio, who returns 4 of the 'Nova top 5 next year, talks about recruiting second-tier runners and her excitement at 2 women coaches in the top 2 at NCAAs (Karen Harvey's FSU team was 2nd). 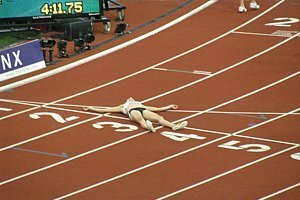 NY Times Looks At Current Research Examining How To Prevent Stress Fractures Free LRC Summary: Shortening your stride and running efficiently can help. So can being a balanced, strong enough athlete. Some of you, however, are just screwed. America - 30,000 Troops To Afghanistan? Who Cares, Let's Hear More About Tiger! "What's the difference between and car and a golf ball? Tiger can drive a golf ball 400 yards." "We made ourselves too accessible to you. It backfires on the athlete. We don't get to write a story about y'all. An athlete makes a mistake, everybody wants to write about it. It's a one-way street, like it has always been." - NFL All-Pro linebacker Joey Porter commenting on the Tiger Woods saga. In this latest statement immediately distributed all over the internet, Tiger admits to transgressions and pleads for privacy. Not at all humorous NBA league spokesman comment: "We have no comment and we hope Ron has a successful season." Orwellian Search Is On For British Paralympians The hard-working British are attempting to build a dominant force of paralympians for the 2012 Games in London. 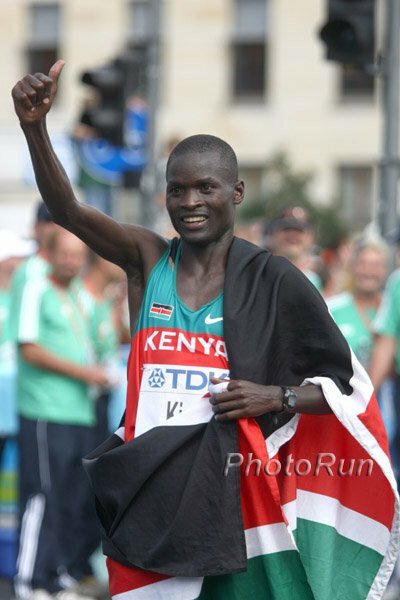 Athletics Kenya Is Suspending All Kenyan Road Races Genius organizational committee Athletics Kenya have decided that all road races in Kenya will be banned because there are too many. Shirtless, Tatooed, Name-Calling Jogger Basically Run Out of New Hampshire Town By Police A savvy letsrun.com reader sent us this gem. Which one of your college teammates will someday have this happen to him? The younger brother of 2x world champion Billy Konchellah and uncle to world champion Yusuf Saad Kamel, Patrick Konchellah was a Commonwealth Games 800m champion and finished 4th at the 1997 World Championships. As brother Billy pointed out, "The guy was a great athlete and ran faster than I did (1:42.98 personal best) and the country has lost one of its most gifted runners." Okoro talks about what it was like to witness the Caster Semenya uproar unfold as the women prepared to enter the track for the Berlin WC 800m final. Comedian Robin Williams Makes Joke About Rio's Tactics In Winning 2016 Olympic Bid - Sparks City's Ire News stations are replaying the clip in Rio de Janeiro and getting people riled up. Another good read that follows two excellent stories on Montgomery (see below). Montgomery pulls no punches in describing the real Marion Jones (not the cute, crying Marion Jones on Oprah). Really a fascinating read. LRC: The NCAAs That Were The Week That Was focuses on one thing for the most part, as last week the world of US distance running was dominated by one thing: NCAA cross-country. We break it all down for you and tell you who flopped (a ton of teams/individuals), who excelled (very few), and what to expect in 2010. Along the way, we talk about mid-d runners Andrew Wheating and Dorian Ulrey, give major props to Gina Procaccio and to the one team that seemingly did well on Monday (Villanova) and tell you why close to 75% of women All-Americans and 60% of men All-Americans had better start getting nervous.